Eleven-year-old Jonquil (known as Quil) Medway is a girl with more than an unusual name. 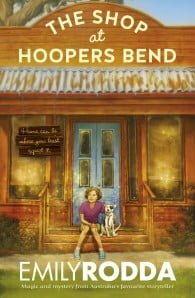 Quil’s parents died in a car accident when she was a baby and she now goes to boarding school, but spends her holidays with an aunt – or at camp, which is where Quil is heading when she decides to get off early at a train stop called Hoopers Bend. It is there that Quil meets Pirate, a chunky little white dog with black spots who immediately adopts her and Bailey, a crabby older lady who has gone to Hoopers Bend to check out the shop that has been left to her by an uncle. There is something magical about the shop at Hoopers Bend though, and once it casts its spell on Quil and Bailey they are drawn together in an unlikely friendship and their fight to save the shop from developers. From one of Australia’s most renowned children’s authors, this is a story about coming home when you didn’t even know that was where you belonged. The Aurelius Shortlist Has Been Announced! Emily Rodda grew up with her two younger brothers on Sydney's North Shore and graduated from the University of Sydney in 1973 with an MA (Hons) in English Literature. Always an avid reader, she moved naturally into a career in publishing, first as a book editor, and finally as a publisher at Angus & Robertson. Emily Rodda’s first book, Something Special, was published in 1984. It marked the beginning of a career that has seen her become one of the most successful, prolific and versatile writers in Australia. She has written or co-authored well over fifty books for children, and as Jennifer Rowe (her real name) she writes popular mystery novels for adults. Her children’s books range from picture books to YA novels, and include the award-winning Rowan series and the outstandingly successful Deltora Quest fantasy series. Winner of the Children’s Book Council of Australia’s Book of the Year (Younger Readers) Award a record five times, she seems to know instinctively what children want to read. She has been a full-time writer since 1994. "I feel very lucky to have a job I love so much," she says. Her four children, including twin boys, have given her plenty of inspiration over the years. "None of the characters in my books are exactly like anyone I know, but all of them have things in common with people I know. Everyone writes from his or her own experience. I look at people I know and listen to them and when I am trying to think of a new character, these things come back to me." All Emily Rodda’s books are testament to her exception storytelling ability. She describes the Rowan books, which combine a classic quest storyline with a series of riddling mysteries to be solved, as being "the most pleasurable to write". Other books, like Dog Tales, which looks at the lives of a gang of neighbourhood dogs, demonstrate her wonderful talent for comedy. Her plots are always beautifully crafted. "I love things that all tie up… There’s no little clue that doesn’t have a meaning and I suppose it’s the fascination for someone who likes word games or likes doing tapestry… maybe it’s a response to the general messiness of life, but I find it very satisfying." And important influence on her writing was the world of the media. Her father was a TV executive, and she grew up with "the ratings" and a great respect for the demands of the marketplace. She acknowledges the need for escapist books as well as those that are more literary. In 1995 Emily Rodda won the prestigious Dromkeen Medal. The judges of the award said of her that she "maintains a prolific writing schedule, continues to provide a role model in promoting children’s literature, and still spends many hours sharing her love of books with children and educators".